Ummar Khan, 42, was bringing home cows that he bought when he was attacked and shot dead, according to his family, which belongs to the Meo community of farmers and cattle-owners. Ummar Khan's family has refused to accept his body unless a Rs 50 lakh compensation is given. Seven months after dairy owner Pehlu Khan was beaten to death in Rajasthan's Alwar, the police are investigating allegations that another Muslim was killed by cow vigilantes on Friday. One person has been detained for the murder of Ummar Khan, whose body was found on railway tracks with gunshot wounds. Six attackers may be involved, the police say. Ummar Khan's family has refused to accept his body, demanding the arrest of the killers and Rs 50 lakh compensation. The 42-year-old father of eight was bringing home cows he had bought when he was attacked and shot dead, says the family, which belongs to the Meo community of farmers and cattle-owners and lives near the Rajasthan-Haryana border. Ummar Khan's two relatives were also attacked -- Javed Khan and Tahir Khan. State Home Minister Gulab Chand Kataria, questioned about the second such incident in the state this year, said: "We don't have enough manpower to control every situation in all cities in time." Action would be taken, he asserted, "whether the accused is Hindu or Muslim". Ummar Khan's body was found hours after the police seized an abandoned pick-up truck with six cows -- one dead and the others with their feet and mouth tied. The tyres of the truck had been removed. "The truck was chased and then suddenly people came out of the darkness and started firing at us, we barely managed to escape with our lives," said 42-year-old Tahir Khan, whose shoulder was grazed by a bullet. 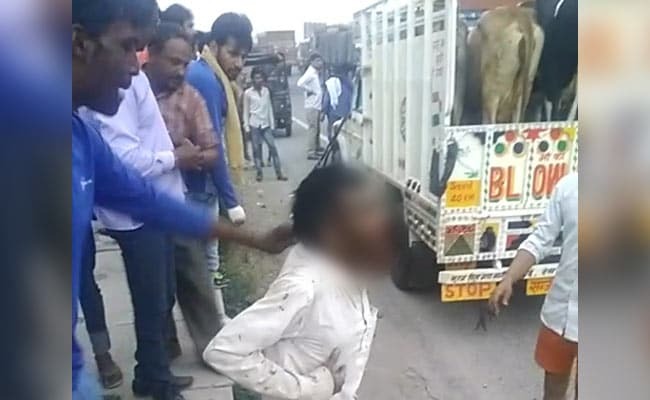 IBut amid allegations of cow vigilantism, the police say they have yet to establish a connection between the dead man and the cattle in the truck. The home minister said it "can't yet be said what is actually the case." Separate cases have been filed, one for murder and another under a state law that bans cattle slaughter and restricts their transport and sale. Sher Mohammad, a leader of the Meo panchayat and a resident of Ummar Khan's village, alleged a cover-up. "Our community is such that every house has two cows. Meos are farmers and cattle rearers...we cannot earn a livelihood if we are attacked like this," he stressed. In April, Pehlu Khan, 55, was beaten to death on suspicion of cattle smuggling. A group of attackers was seen grabbing Khan by the neck, bashing his head to the ground, kicking and punching him. The Rajasthan police recently gave a clean chit to the six men he named in his dying declaration, saying there was no evidence against them.